The mobile version of the Fallout video game has just been released and in only a week’s time, it has gained so much popularity particularly among those using Apple devices. Android users are now eagerly awaiting the next release for their mobile gadgets. The release date of Fallout on Android platforms has not been confirmed but reports have it that it should be by August. This means the Android version is still being completed and should be out soon, according to a member of the Fallout Shelter team. Why the mobile version? It’s because of the fact that more people now play games using their smartphones, said Bethesda Game Studios game director Todd Howard. He added that they have always wanted to create a mobile game and now that it has materialized, they are overwhelmed with the reception their first mobile game got from smartphone users. As proof of Fallout mobile game’s success, here are some statistics worth noting. It has reached the top of the list of highest grossing apps in its first week on the App store overtaking the famous Candy Crush. In its first two weeks, the game already raked in $5.1 million. Fallout Shelter also remains to be at the number one spot for being the most downloaded free game on the App Store. As of June this year, the game was the most downloadable free app in the U.S. App Store. It has also become the third top-grossing iOS app in the U.S. and the U.K. The question now is “Can Fallout Shelter surpass the achievements of Skyrim, considered to be among the greatest video games of all time and also developed by Bethesda?” It’s indeed a tough choice between Skyrim vs Fallout. 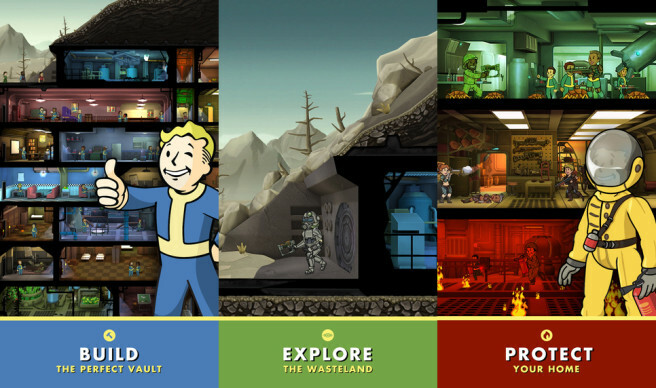 The Fallout Shelter video game features a high-tech underground Vault that allows gamers to build their own Vault which they need to manage and protect including their resources and dwellers from the dangers of the Wasteland. The game also lets dwellers to be sent above ground where they can obtain survival loot but once they fail to go back underground, they will perish above. Dwellers of Fallout Shelter have a special rating which corresponds to their stats. They are categorized according to strength, perception, endurance, charisma, intelligence, agility and luck. It was only in June that Shelter got its first Fallout 4 character which resulted in a new feature update. The update introduced a photo mode which allows gamers to capture and share images of the Vault they have created. Gamers who love to use the Xbox One, PS4 and their personal computer will have to wait a few more months before they can play Fallout 4 in their preferred device. It is due for release by November.